We had a very fortuitous night at Lunenberg . Our camping spot (by the visitor’s center) was nestled a bit higher in elevation that the actual city, and therefore avoided the rain shower and temperature was perfect. However, the mosquitoes also appeared to think it was a dreamy spot. They didn’t swam or anything, but did provide us a few “love bites”. Lunenberg is absolutely quaint, and well worth any time spent here. It is home to the Bluenose II (reproduction sale ship), and 2-4 blocks of quaint shops. Very good eats also. We had Chowder and mussels dinner overlooking the bay. The chowder , although white in color, is very watery (vice thick) and therefore very plateable. Lunenberg has somewhat of bankers hours. Would be better to arrive very early afternoon and spend a few hours meandering around. We arrived a bit tardy, and by the time we set up camp and set of to eat it was nearly 1800. As we departed at 0900, the town was still asleep. I didn’t realize that Mahone Bay was only 20 mins out of Lunenberg. We stopped for Breakfast, and again you would not be disappointed to spend a night here either. I never thought I would have to say that a trip this long would be behind schedule—but we are a bit behind schedule; we had to chose to either stay in Halifax and then take the highway into Sydney or forgo Halifax and continue on our merry little way via the coastline. As we approached the bain of civilization though, it became crystal clear that Halifax was not going to be our thing this trip. Since we had already been there once, and Trans-lab trip next year will surely need a bit of civilization, we chose to option b. So we have finished up the Evangeline and Lighthouse By-ways tours. We are now in the middle of the Marine By-Way. The Marine by-way is not nearly as scenic as the Evangeline or Lighthouse, but Marine is much faster (typical speed is 80-90KPH) and curvier. We’ll finish up the Marine By-way tomorrow. 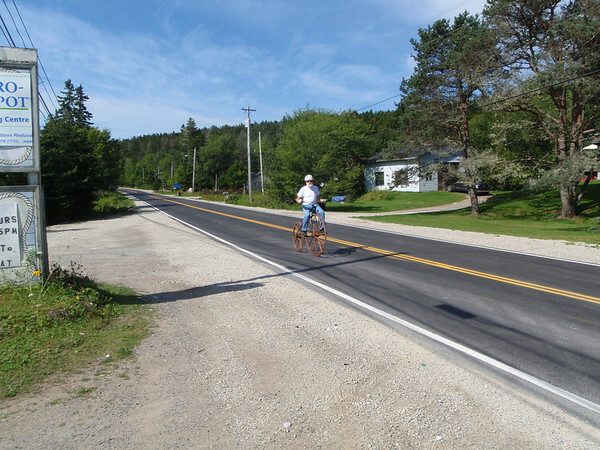 We did pass a man riding a 1855 replica peddle bike along RT333. 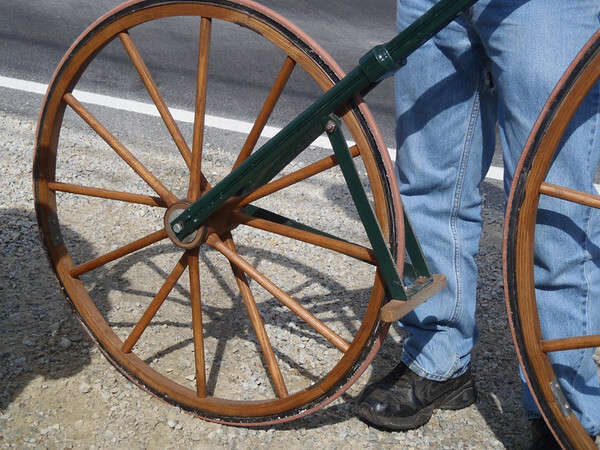 The bike has no gears, and currently he presses his shoe against the rear tire to brake. After passing him, we decided to find a spot to wait for him to catch us for a photo op. 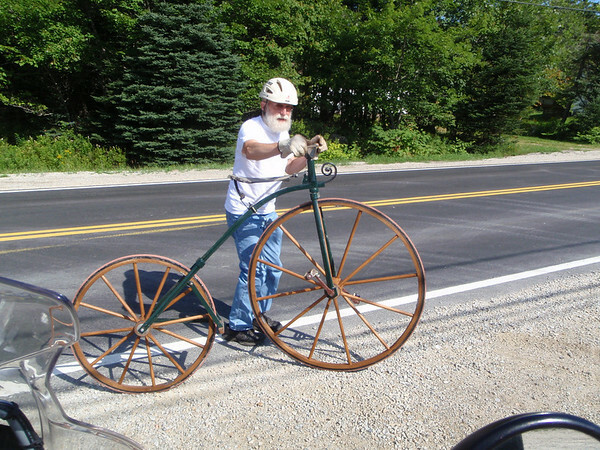 He was the most interesting man, and turns out made the bike from a few photos he saw. 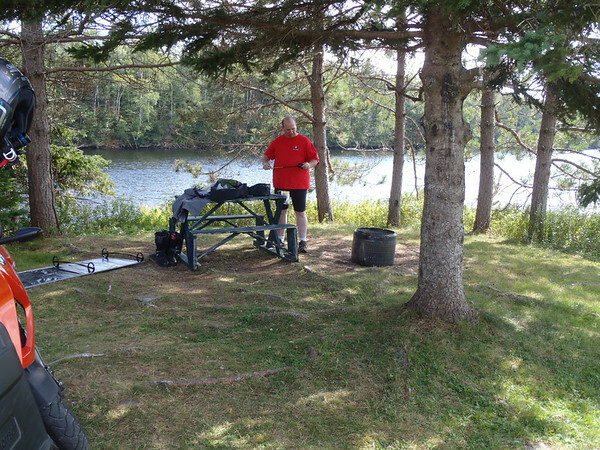 He apparently rides the bike 20KM per day, and intends to ride the Cabot trail in the fall with the bike! Perhaps the most disappointing part of the day was Peggy’s Cove. Touted as the “must do”, it appeared to be no more than a few ramshackled establishments and a nice lighthouse. 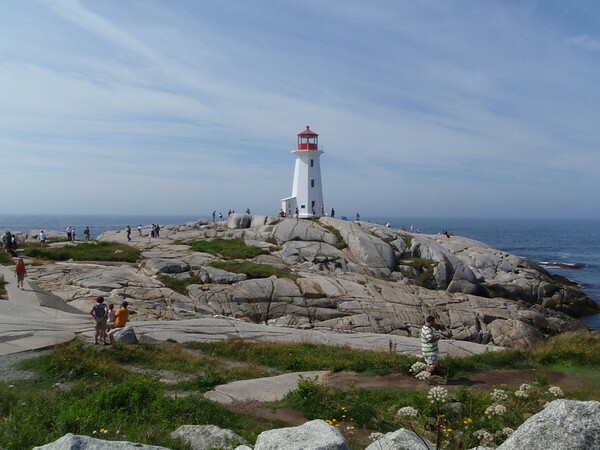 However, of all the towns on the water and all the lighthouses to date, Peggy’s Cove didn’t even rate high enough for us to take helmets off to walk around. Hindsight, it more of tourist trap than a town of presence. More boat triva: Back in the late 1600s, paint was very expensive due to high taxes. However, the paint used for boating not taxed. Therefore, it was a common practice to overbuy your boat paint, and paint your house to save some $$. Because of the this, many Captains houses ended up matching their boats, in wild, high-intensity colors. Tonight, we again camped literally right on the Salmon river. No bugs to speak of. The campground originated in 1885 as a Sulfurite pulp facility. The weather was perfect all day—partly sunny high 60s to 80s.